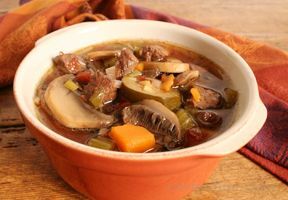 1) Cut beef into bite-size cubes, if necessary. 2) Brown the beef in a large, heavy kettle, using a little bit of oil for each batch you brown. Don't put too much in at once - it will just steam. You want to get a nice, dark-brown color on each piece. 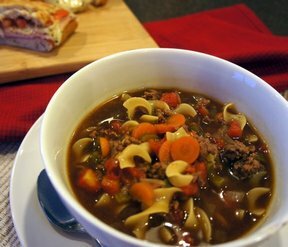 3) When done browning, add soup packages and 4 c. water, or stock, or consommé, or soup base (according to pkg. directions) - stir up the brown bits and flavor from bottom of the pan. 4) Add the meat to the stock. 5) Add the can of crushed tomatoes. 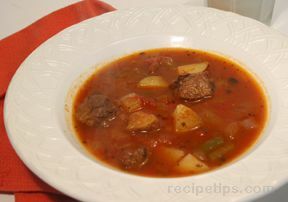 6) Turn down heat and simmer until meat is tender - 1 to 2 hours. 8) Bring everything to a boil and add the pasta. 9) Stir frequently until sure pasta is separated and cooked. 10) Add green beans and corn. Simmer until heated through. 11) Add salt and pepper, or other seasonings, to taste.